According to the Bureau of Labor Statistics, only about 55% of the American workforce has access to a 401(k) and only about 38% of the total workforce participate. Doing some low level math, that means roughly 31% of those who have access to a 401(k) are not participating. What are people doing with their money? 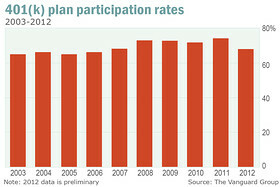 At a 38% total workforce 401(k) participation rate, no wonder why everybody is worried about retirement. With 31% of workers with access to a 401(k) not participating, this looks a whole lot like self-inflicted pain, which is one reason why the wealth gap continues to increase. Even though I recently wrote about the average 401(k) balance finally breaching $100,000, we’ve still got a long way to go. The reason why I’ve been such an avid 401(k) contributor my entire career is because I knew I didn’t want to get in at 5:30am in the morning and leave after 7:30pm for the rest of my life. The only way to extricate myself from a tiring life was to save and save some more. Besides, once your 401(k) is set up, saving becomes easy due to automatic deductions. Now that I’m out of the work force, I think it’s a duty to expound upon the reasons why everybody with access to a tax-advantaged retirement plan should contribute. Once we get the participation rate up, then we can work on increasing the savings amounts. Let’s begin. Personal finance is emotional. So here are several emotional points which I think will help spur you to save more. 1) You will eventually become bitter and angry. Almost every recent college graduate comes out bright-eyed and bushy tailed about their future if they land a job. They all love their jobs (or at least love earning money) and can easily see themselves working for years they say. After the 10 year mark, I’ve noticed a MASSIVE drop off in enthusiasm. Why? Perhaps during this time a colleague stabs you in the back, you get passed over for a promotion, or you get a much smaller raise than expected. Maybe you’re just bored out of your mind after doing the same thing for 10 years in a row. As a manager in my previous life, trust me when I say that one of an employer’s main goals is to give you the least without you leaving. Often times employers mess up this equation, and that’s when all hell breaks loose. Just read the different styles of writing between a millennial blog, a Gen X blog and a 50+ blog and you’ll notice a very different outlook on all things. Perhaps you won’t actually become bitter and angry, but you will eventually shake your naivete to see the world for what it really is: a cruel, cold, dark, and thankless place (unless you live in San Francisco or Hawaii) where everybody looks after themselves first. The trick is to accumulate enough money so that by the time you face reality, you’ll have options. 2) Freedom brings intense joy. The biggest benefit to being financially independent is freedom. Now that I’ve tasted absolute freedom for the past two years, it’s very hard to be forced to go back to work for money anymore. Going back to work for a new experience, a new challenge in a different industry sounds tempting. But going back to work for the main purpose to make more money feels empty. It’s hard to understand what such freedom feels like by simply telling you it’s magical. Think about those morning surprises in elementary school when you find out you don’t have to go to school due to a snow storm. You end up making waffles and pancakes with your parents who also don’t have to go to work. Freedom feels like those mornings you wake up thinking it’s a Monday, but it’s really still Sunday times 100. Freedom feels like when you’ve finally found the love of your life – you never want to let go. 3) The government is wasting your money. The more you can protect your money from the government, the more you can prevent greedy politicians from misappropriating funds. If you are against wars, know that the government spent close to $1 trillion of your tax dollars in Iraq, resulting in thousands of casualties. If you are against power hungry politicians, just look up Anthony Weiner, Elliot Spitzer, Rod Blagojevich, Jesse Jackson Jr., Edwin Edwards, Spiro Agnew, Carroll Hubbard, George Ryan, James Traficant, Randy Cunningham, Huey Long, Robert McDonnell, and many more. They will make you sick to your stomach when you learn how much they embezzled and abused their power. If you’re still optimistic that the government is wisely spending your tax dollars, do some research on the number of homeless veterans in America, pension amounts for your city’s top officials, income tax burden distribution, the net worth of the 20 wealthiest members of Congress, and how our public school test scores compare to international peers. Ignorance is bliss, which is why such government malfeasance is tolerated. But you aren’t ignorant. You are a freedom achieving machine who understands that money is just a tool to achieve your objectives. 4) Prove your doubters wrong. How many people went through high school picked on by bullies? How many times have people doubted your abilities, told you you weren’t good enough, or said you’d never amount to anything? I’ve experienced a ton of hate and doubt growing up overseas as a foreigner, as a minority going to college in the South, as a blogger, and as an aging athlete. Every single negative incident motivates me to try harder. Without hate and doubt, I seriously believe life would be too easy for the average person in this country. We should embrace our skeptics with love. The great thing about money is that it’s largely blind to who we are. Anybody can make money, which is why money is such a large focus for many immigrants who come to America. Many of the immigrant families I’ve spoken to focus on two things when they arrive: 1) getting as much education as possible, and 2) trying to accumulate as much wealth as possible. I’m sure these two things are important to many other Americans as well. By having enough money, nobody can ever oppress you again. 1) Host a mandatory retirement seminar for new employees. Educating employees in the very beginning is the most effective way to get them to start saving given they are so excited to do whatever you tell them to do. In addition to educating all new employees about the firm’s retirement benefits, host mandatory retirement benefits seminars every year for existing employees. It’s incredible how few employees read their employee handbooks. If more employees did, I bet a higher number of workers would feel greater job appreciation thanks to understanding all of their benefits in detail. Thanks to reading my employee handbook, I realized that my employer would pay for my part-time MBA if I agreed to stay for at least two years after graduating. I happily applied and my employer footed the $80,000 bill. I also learned about my employer’s sabbatical policy, which stated that one can take a one-to-three month sabbatical after five consecutive years of employment. Unfortunately, I did not take advantage of such a benefit because very few people took sabbaticals. 2) Provide as many low cost investment options as possible. One of the biggest push backs for not participating in a 401(k) is high management fees. The other big complaint is a lack of mutual fund options. There needs to be a diverse offering of low cost mutual funds from the likes of Vanguard and other low cost fund providers. I rolled over my 401(k) into an IRA mainly for these two reasons. My old 401(k) provider was Fidelity Investments. As a result, we naturally had many Fidelity Investment funds to choose from in our 401(k). Fidelity is an excellent financial services company, but some of their portfolio fees were egregious. For example, I was paying a 1.6% annual fee to invest in a Fidelity Tech Fund. 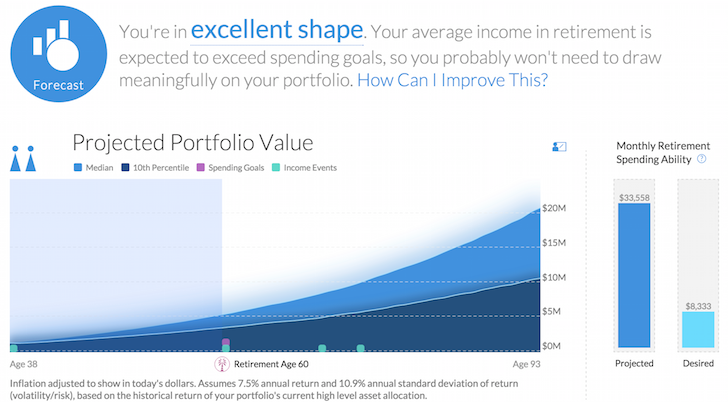 I had no idea until I ran my portfolios through Personal Capital’s 401k Fee Analyzer. (See: How To Reduce Your 401(k) Fees Through Portfolio Analysis). 3) Incentivize mandatory participation. The easiest way to incentivize employees to save is to make it crystal clear in an e-mail or in a seminar the employer 401(k) match policy. We had one fella come around to speak to us once a year about how he accumulated millions in his 401(k) thanks to our company’s employee match and profit sharing program. It was a little obnoxious, but I’m sure it motivated younger employees to start maxing out their 401(k)s.
At places like McKinsey Consulting, a portion of one’s paycheck automatically gets funneled to a tax-free retirement plan because they know its wise to train their younger employees to start saving early. The federal government opened the door to allow employers to automatically enroll employees in 401(k)s eight years ago, with the Pension Protection Act. Unfortunately, there’s only about a 3% participation rate. In Australia and Singapore, a portion of each paycheck also gets saved in a retirement savings plan called the Superannuation Fund and the Central Provident Fund. These two countries have the largest inheritance amounts per individual in the world as a result. If employers can be upfront in highlighting their employee match policy and provide charts as to how much one will have after saving for XYZ number of years, more people will save. The biggest irony about the 401(k) is that employers are not incentivized to get their employees to participate because employers want their employees to work for as long as possible. Once an employee has enough money, there’s an increased flight risk as she realizes she’s no longer beholden to a job. The Affordable Care Act is one of those government policies that emancipates many low-to-average income workers from bad job situations to do something more meaningful with their lives as well. As a small business owner myself, all I see are many new taxes I’ve got to pay that I never had to pay before as an employee. It costs money for an employer to administer a 401(k) plan. Such costs are usually passed along to participating employees. And given the abysmal loyalty of employees nowadays, employers are more reluctant to offer generous retirement packages. Part of the reason why I appreciated my last employer so much was because they not only provided a 401(k) match up to $3,000, they also gave employees profit sharing contributions. When I was thinking of leaving my job, I had to think a little harder because I’d give up $25,000 a year in total employer retirement contributions. In the end, I decided to take the leap because if I didn’t, I never would. A great retirement benefits plan is an excellent way to attract the most talented, and most loyal people. Employers need to do more to make clear their benefits when hiring. Meanwhile, employees must get educated about what the employer has to offer and make 401(k) contributions a priority if they don’t want to end up bitter, angry, and poor (point #1). Please make an effort to contact your benefits administrator immediately. To give you some motivation through a visualization of what you could have once you start participating in a 401(k), please take a good look at the chart below. For 2019, you can now contribute a maximum of $19,000 a year as an employee to your 401(k). The low end assumes a consistent maximum contribution of $18,000 after the first year contribution of $8,000 with zero company match and zero growth. The high end column assumes a consistent maximum contribution of $18,000 plus a 5%-10% annual rate of return with zero company match. Now imagine how much more people can save once a match and profit sharing contribution kicks in. Save early and save often people! The longer you can stay at an employer that provides profit sharing, the better. Manage your money in one place for free: Run your 401k through Personal Capitals’ free 401k Fee Analyzer. The online program will quickly show you how much you’re paying in portfolio fees a year. The tool highlighted $1,700 a year in fees I had no idea I was paying. I ended up switching out of a fund with a 1.6% expense ratio into a 0.2% expense ratio Vanguard fund with similar attributes as a result. Great information as usual Sam! I pass along your info to friends, family and my grandkids. Thanks to my employer’s 401k program, I was able to retire early and am living the dream. My advice to all the youngins in my life is to live simple and save your money. Thanks for sharing my site to your family Margaret and congrats on retiring early! Sam, how do you feel about financial gurus telling people to stop contributing to 401K funds due to paying off debt as quickly as possible. I know a financial guru who has a big following of 10 million people, that can sway contributionn numbers slighlty. He suggests to stop it for two years while you pay off debt, then starting it once debt free up to 15%. In the debt repayment case, are those people right in stoping 401K contributions? You know the sad thing about all of this Sam? I honestly believe we are about to see an epidemic of retirees out on the street in the coming decades. I believe it will be so bad that politicians will base their entire platforms on providing government programs for the elderly. But the truth is in the numbers and as you pointed out individuals are not securing their retirement during the years where they have active income. People are living for today and not the future, but when America sees the elderly out on the street they will want the government to run to the rescue when in fact it was their own doing. Thanks for sharing these stats Sam. I think those rates are even lower up here in Canada. I hope it means people are saving other ways, other than with their employer. Hopefully. We all need to save for retirement if we want to stop working some day. I can’t believe that people wouldn’t participate in a 401k! Don’t expect the government to support you! I’m kinda lucky, my retirement options are much bigger than most, simply because I live in Australia. We have a mandatory system called superannuation that all employers/employees have to participate in. Gives me a greater chance to retire a millionaire simply because I HAVE to fund my own retirement. I am on the low side for my age even though I have been maximizing my contributions for several years. I did take a few years off for graduate school so that explains some of it. But I forgot to include my rollover IRA fund which was from previous 401k contributions. When added in, I’m actually doing better than originally thought. Cool. Folks should definitely add any rollovers and other retirement savings and compare such amounts to my chart. What did you study in grad school and what are you doing now? My first job out of college matched the 401K 100% up to 6% but I was not educated on the subject yet. I completely agree that education is critical to more people consistently contributing. I am much wiser now but my current employer matches far less. In July we are switching 401K providers from Metlife to Fidelity so that will be a good opportunity to find the lowest fee options available. I am in favor of automatic enrollment! If this were required of all employees for even as little as $5, it will increase participation. As soon as you start a 401K you are more apt to increase your participation. I have never worked a job that I had a 401k offered. I did spend 8 years in the military, we had the TSP which is the 401k basically. But at the time I did not know about it even, nor did I have interest in investing. At one point I did open a Roth with Bofa, but I was put into some horrible funds that underperformed the US Market(s&p). My mistake was not being proactive and doing my research. So eventually I did my research and now I’m with vanguard and sticking with low cost index funds. My current job still does not offer a 401k, so I been maxing my IRA and investing the rest into my taxable account with vanguard. I like to keep it simple! Some times it’s hard just keeping it simple even. I offer a sep ira to all my employees who have worked for me a minimum of 3 years. For the last 10 years I have given them all 7% of there gross annual salaries. Free Money! I also pay a fee only broker to come to our business every year and give them impartial advice on where to put there money. Out of the 16 employees who qualified, 4 cash out there contribution as soon as it hits the brokerage firm. 10% penalty plus taxes. Half the employees keep the money in a money market because they are afraid of the stock market. I even had 1 employee who asked me if I would talk to our broker. It seems her last years contribution sat in the money market all year when she wanted it in something else. I asked her how she didn’t realize it was still in the money market when we get a statement every month. She said she only looks at the total value, not where it is. My point is even though I give free money, pay for someone to help them, half the people cant be bothered. By the way, we have weekly Nascar and NFL pools at work. they’ll spend 20 minutes a week researching there picks, but wont spend more than 10 minutes a year on there IRA. Amazing insight Bill! You seem to be doing everything you can to help them out, yet the “yield” doesn’t seem that great. I wonder if you highlight the chart in my post and tell them this is what they COULD have, whether more people would get on board? Gotta love them sports pools! I guess the secret is: people will always prefer the fun and easy route. I think 401(k) tax incentives will erode over the next decade, double taxation especially for a more affluent side of populace but in reality effecting all. There are already proposed tax caps in budget talks for 2015. My company matches 100% up to 3% and makes a 5.5% yearly contribution. (They used to match 100% up to 6% and we used to have a pension). What really makes me mad though, is my employer consistently fails the IRS test for qualified plans so they cap our contributions off at 10% for all employees who are HCEs (highly compensated emplyees). An HCE is defined as anyone making over $115K for 2013. Sometimes I make over that amount based on bonuses and overtime. What makes it worse is that the 10% contribution comes out of my base salary (not bonus or overtime). So I end up only being able to contribute around $10K a year. I want to max out my 401K but can’t. What can I do? They gave free donuts and people still did not attend – that’s the differnce between Canadian’s and American’s! Free donuts and American’s will definately show up! Will they then sign up – not as definate! Seriously though it is sad that people do not sign up and do not put in AT LEAST the amount that will get them the full company match. I see you updated your BLS stats at the top of the post — I hope the feedback I provided was helpful! Your post made me think and I expanded on this topic on my own blog this evening. As the owner of a small business, I can give a perspective on why more companies don’t offer 401(k) plans — the access side of the equation instead of the participation side. I won’t include a link to the post here in case that will catch my comment in a spam filter, but it’s the first one up if you click through. Thanks for all of the great content and commentary! Great catch and I think you are right, hence the upgrade. Still, a 38% total workforce participation rate is really alarming, because you know the other 62% probably aren’t saving as much. Thanks for your contribution! I think there is a lot of doubt about that happening – I think the chances of it happening are close to 0%. However, 401K withdrawals are taxed at earned income rates – are these rates likely to go up – almost certainly. A wealth distribution from those who’ve saved to those who haven’t saved is definitely a possibility. Getting a Hail Mary bailout is definitely something I’m sure many people are hoping for. We should use our fear of that happening as motivation to spread the “gospel” about saving early and often. The more people that are accumulating wealth, the more support there will be for legislation that doesn’t take that diligently earned wealth away from us. I feel like Dave Ramsey is on the front lines of this, with his effort to get people achieving and living with a positive balance sheet, net worth. Last week I stumbled across a paycheck deduction calculator that clearly illustrates how the attempt max out 401k contributions will impact your take home pay. Not only does it show how little impact small percentage changes to your contribution rate impact your paycheck but also how to plan to live within your net pay after a maxed out contribution. Some of the best financial advice I ever got was day one of work at my second employer. A managing partner asked me how much I was going to contribute to my 401k, and I said up to the company match which was 6%. At the time I was relatively junior and he knew the 6% didn’t equate to maxing out the 401k. He looked me straight in the eye and said I was dumber than he had originally thought and walked away. He later took me aside and explained why by all means possible I should work to max out the 401k, I have done it to this day, other than a two year hiatus when I worked overseas. Thanks to that advice and assuming the government doesnt steal my money I am confident I can live a nice retirement. It may not be skiing in courchevel and gambling in Monte Carlo, but I think many would be suprised how far their money can go in the U.S. you don’t need to make genius decisions, just don’t live beyond your means, contribute to 401k, drive reasonable cars (that maybe cost even a little more than 10% of annual income) and shoot to pay off your house or a property faster than 30 years and you should be in good shape. Wow, that is the TOUGH LOVE I like to hear! I’ve been toying with more tough love type of posts with, “Maybe It’s Your Fault Why The Wealth Gap Continues To Widen” in order to really drive home a point for people to make better choices, but I feel bad. It’s hard to believe people don’t max out their 401k. I’ve maxed mine out every year since graduating and still feel stressed that I won’t have enough money in retirement. The stress of an underfunded retirement account is far worse in my opinion than having less spending money today. 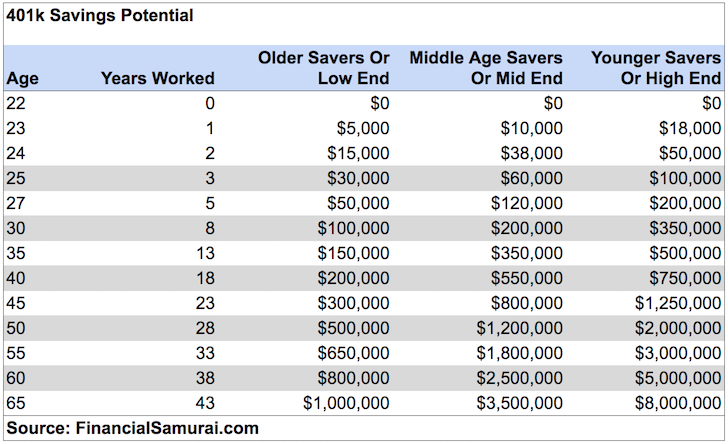 I do identify with people who want to retire early, but to me that means you need save more in addition to, rather than in lieu of, contributing the maximum amount to a 401k. Also, that chart doesn’t frustrating for those of us who spend much of our 20s in higher education. You are acting totally rational, which is good. The stress of a underfunded retirement feels worse than the act of saving now. That is the better way to feel than to YOLO your life now and end up with much less. With each dollar you contribute, hopefully you will feel less stressed. Are you sure you’re only assuming 5-10% interest and 0 matching by employer for high end? $38k after 2 years means a growth of $3k on a principal of $17.5k after one year, which is 17.1%. Good question Dave. It depends on timing of contribution. Say you gain 0% after the first $17,500 and 10% on your total the day after you contribute another $17,500. That $35,000 becomes $38,500. One can obviously front load their contribution or space it out over time. I wouldn’t get too nitty gritty into the weeds as the chart is meant as a guide. I don’t assume any company match either to err on the conservative side. I think your math is a bit off. After two years, in the high estimate you’d have principal of $35,000 (two years of $17,500 contributions), so a total balance of $38,000 would require a max gain rate of ~8%. The math on the three year high estimate proves your point a bit better (the principal would only be $52,500), but only if you assume the earnings aren’t being compounded. If you were to do a CAGR calculation that accounted not just for a growth rate off the balance but accounted for the new principal each year I think you’d see that rate drop down closer to 10%. Regardless, it’s a good reminder that the low estimate is all anyone (who’s 22 today) can influence, control, and achieve. And to put things in perspective I’ll share the fact that it’ll cost about $219,000 for a couple to eat in retirement, just eat. That assumes $5 per meal, per person, 3 times a day, 365 days a year for 20 years. On the two year example, I think you’re forgetting that there were two years of contributions. The principal is $35,000 after two years, so $38,000 account balance would require ~8% of investment gains. I’ve only worked non-profit so 403(B) for me, but I’m still having difficulty signing up for my 403(b) even after being here a while because they don’t do meetings about it and we don’t have a true HR person… it’s bizarre. A lot of non-profits don’t do matching but even if it’s a small amount, it incentives employees to stay and contribute to retirement. I greatly enjoy your articles Sam and do contribute to my employer’s 401k plan. I’m quite concerned, however, about the spectre of forced Treasury allocations/ outright theft of a 15 trillion dollar low hanging fruit for a bankrupt government. .gov is populated by sociopaths and liars who will prolong the decay by any means necessary. Do you have thoughts on this possibility? Its nothing anyone can control but also being liquid enough and under the radar if you fear such a takeover has its merits. Ty – It’s definitely possible the government could decide to rip us off by charging us an Exit tax on our 401k funds or keep them altogether. This is why we should write our 401ks off mentally, and continued to save beyond these vehicles. If the 401k is there for us during withdrawal time, then great. IF not, then we can start a mutiny and at least we have other funds. There are times I look at my 401(k) balance and think that I’m not saving enough. While that’s certainly a possibility, it does take a little of the sting away when I realize that even though I think of myself as behind, I am so much further ahead than the average American. Those are some scary numbers! True, although comparing oneself to bad stuff ain’t that good. The past two companies I’ve worked for automatically enroll you into the 401k plan (albeit at a TINY percentage of income) and make you opt out if you wish not to contribute. I think that’s a good way to increase participation, but more really needs to be done than auto enrolling what amounts to a token contribution. Intimidation.. that’s a good point. So employers should provide various options on how employees can invest their money based on their risk profile. When you make a ton of money it’s easy to preach about contributing the maximum $17,500 per year to your 401k. But, when you’re only making 40k that contribution is more than half your after tax pay. Not exactly doable at that salary, and the ACA will be yet another tax that you’ll be required to pay whether you want or need health insurance at all. The gov’t is full of greedy bastards. Good thing the 401k is pre tax contribution and singles or couples making $40,000 get subsidized for ACA. As you said, Sam’s suggestion to max 401k while earning $40k is pretty nuts. But keep in mind that it completely depends upon where you are in your life’s journey. I’m working to bump my 401k up to the max, while holding a 15 year mortgage, 4 kids, and a stay-at-home wife. I literally increased it up to the max recently and will hopefully be able to adjust payments and lower expenses to keep it at that level. I doubt very much that it’s going to be easy at all (not to mention cramping some of my current lifestyle), but it is all for my own future self. Keep in mind that Sam suggesting you max it out isn’t to say that you are dumb or lazy if you don’t, but I can’t tell you how much better it feels to be growing my retirement savings account faster and faster every month and every year! And FYI, my 22 year old nephew keeps telling me how tough it seems to save (even though my nagging him has managed to get him to put some money away), all the while deciding to lease a sharp looking new truck that costs $500/month at least … which he can afford while living at home with mom and dad. He could have easily funded a Roth IRA which I was pushing him to do. But ce la vie. Love it! The American dream and dilemma at its finest. All we have to do is to make it cool not to own a car. It’s not too bad if you don’t have kids. My first job out of college paid $36k, and I’ve been maxing out on retirement contributions since day 1. You just have to pretend you make a lot less and figure out how to make the budget work. Looking back, I’m so glad that was my mentality from day 1. It’s kind of interesting, here in Cayman it is required by the government after 6 months of continuous work with one employer, you have to contribute 5% of your salary to their version of a 401(k), with your employer matching your savings 1:1. When I was contributing to a 401(k) back in the US, my old employer used Merrill Lynch. When I switched my accounts to IRA’s and did a little more research, I quickly realized they had sold me on funds that were charging pretty high annual fees (~1.25%). So I switched the accounts to self-directed funds to be able to purchase vanguard indexes with much lower fees. Man, I’d love to really learn more about life in Cayman and the banking industry. I have to imagine there must be so much wealth and funny stuff going on there! By the way, great article! Always enjoy your insights. I have been contributing for over 20 years. However, for the first 10 or so years – we were only allowed to contribute up to 10% of our salaries even though the IRS limits were higher than this. I do not really contribute to my 401k. I used to put in 3% to get the company match. I stopped contributing a couple years ago though. My focus is on purchasing cash-flowing rental properties and having enough properties so the cash flow replaces income from my job. Once I build that cash flow it should last forever so I can use that straight through my retirement. Rather than put money in my 401k for 30 years later, I prefer to use the money now to grow my real estate portfolio. I do stock investing through my own account also but that is on the back burner now also. I am self employed and own my own business. I don’t have a 401k, but I have an IRA. I don’t contribute the max, because I want access to my savings now, not 30 years down the road. My investment goes to rental properties. They have great tax savings as well. I get immediate cash flow and build something great for the future. If your employer offers a match, even not so great fund offerings shouldn’t dissuade you from participating (even if it’s just enough to get the match and no more). At my last job, the match was 1.5% of base salary if you contributed 6%. Not a great match, but I still put in 6% for the free money. Now I have a much more generous 8% of base salary match if I contribute 8%, but I also make more so I have it set to withhold 15% for my 401K. I would save more, but right now I’m trying to build up some liquid savings and investments, and I plan to have to buy a new house/car in the next 5 years so liquid investments will be key. Most likely, I will increase my contribution % until I reach the annual max of $17,500 in pace with my salary increases. I depleted a lot of my cash in the past 6 months by buying a bunch of investments, so now I have to rebuild a bit. First world problems..
As far as why people don’t contribute, who knows. The math is obvious and suggests everyone should save, whether in a 401k, IRA, Roth, or taxable account. Still, not many people do, and those that do don’t save enough. I think it’s a cultural thing. There is no widespread support of retirement savings. I like the idea of forced savings like Australia has. I don’t know the details, but I don’t see why in the US the govt could not mandate that 5% of employee gross income be matched by the employer and contributed into a savings fund. Then, require a lengthy and annoying process if you want to get to that money before age 60. It forces everyone to at least save a little. That way, less people will be on public assistance in retirement. I’m not against supporting disabled retirees, and maybe it’s just a cultural difference for me, but I don’t see the societal value in paying outrageous amounts to support older retirees. My own father told me that if he gets really sick in his old age and if it would require vastly expensive medical care, then to just forget about it. To him, it makes no sense why a society should pay hundreds of thousands on cancer drugs, hip surgeries, etc, to save an older person, while young kids every day go without proper nutrition and education. My opinion is that as a country we are focused more on treatment than prevention… as well as the obsession with consumption. Ravi – Great job contributing more to the 401(k). You are right on the need for the country to focus more on prevention than treating the problem. The medical industry is very focused on this. I’ll give credit to the company I work for – they automatically enroll all new employees into the 401(k) plan at a 3% contribution rate. The only way for it not to happen is for the new employee to manually go into the system and do an override. Aside from that, there’s not much more to brag about. They do have a company match, but it’s a really low % and was slashed from what it was back in 2009. There is no profit sharing. They’ve also continuously passed a bunch of the fees on to the employees (usually without any disclosure!). The funds are also Fidelity so there’s the high expense ratios and other fees that you mention, Sam. And this is at a Fortune 50 company (actually even bigger). Despite all that, I’ve recently increased my contributions to the $17,500 max…so, I’m doing my part to bump up those national averages! Nice job maxing it out! No brainer if you can as you’ll wake up years from now and be amazed at how much you’ve saved. My company offers a generous 401(k) plan, matching 75% up to 8%, and used to offer an even more generous pension plan until they decided to shift to a defined contribution plan in 2019. Other than wanting more spending money now, whether to pay off bills/debt, or to buy crap, I cannot think of any reason to not contribute to a 401(k) plan that offers matching, even if the investment options are crap. With the Pension Protection Act my employer automatically enrolls you in the 401(k) at a 3% contribution rate. The employee must opt out in order to stop contributions. Also, all new employees receive the defined contribution regardless. I have not seen any numbers for the participation rate at my company, but I’m sure it’s pretty high given all of the financial seminars and automatic enrollments. I turned 30 last year and am at the high end of the table, so I know first hand the benefits of high contributions, very early. Add my 401(k) balance to my IRA balance and you have the makings of a nice retirement. God, I love compounding. 10 years later, you will love it even more! Great post Sam. I can’t believe the non-contributing rate is so high. 38% of people who can contribute, do not contribute at all!! I wonder how many of the remaining people only contribute a very, very small amount (below the maximum level matched by their employer). Crazy. My husband and I both put the maximum into our 401K’s and into Roth IRA’s. We are fortunate to have good paying jobs and that we both like to save. I think the main reason people don’t participate in a 401K is the same as why people don’t save in general. They don’t want to. I realize that not many people have the incomes my husband and I have, however, there are alot of people that do not live within their means. There are plenty of expenses that some people can decrease in order to save, they just don’t want to. They have plenty of excuses whey they can’t save, but no real reason. We are able to save as much as we can, not because we are considered part of the 1%, but because we keep our expenses low. The only debt we have is a mortgage. No car payments, no cable, one cell phone (which I need for work), etc. Totally agree with this. I think that folks in this country don’t want to give up their lifestyle for something that won’t happen for many years. In the end they think someone else (family, government) will take care of them. I have a colleague at work whose wife decided to stay home with their kids 10 years ago. 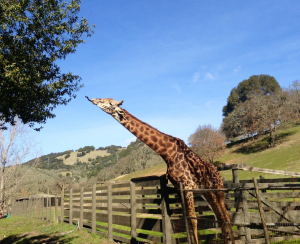 Instead of scaling back their lifestyle, he decided to stop contributing to retirement. In the meantime, they’ve put in a new pool, buy expensive electronic equipment, jewelry and cosmetic procedures for the wife. He’s 55 now, she has no plans to start working again, and they still aren’t contributing to retirement. I’m scared for him because layoffs are not uncommon in our industry and he seems to think the company will want him to work until he is 70. I disagree with your statement that companies want you to work as long as possible. On the contrary, they’d rather hire someone younger and less expensive in exchange for newer skills and a fresh attitude. Car free since 2004 and cable free since 2001. One cell phone is pretty difficult, how do you manage? My wife’s company offers a percentage match on whatever the employee puts into their retirement plan. So she gets the benefit of doubling her money anytime she makes a contribution. This should be a no-brainer for anyone looking to invest and save for retirement. It doesn’t make sense that an employee wouldn’t take advantage of that benefit if offered. Your wife has a 100% match? Is there a dollar limit? That’s a great match! Interesting. I’ve worked for companies that have had a 401k (and generous match) and have had a 401k (with no match). I did not participate in the ‘no-match’ 401k as I felt a Roth IRA would be a better use of my money. Any idea what the participation rate is for those 401ks with a match? I would hope it skews higher. No idea Rob, but surely it must be a little higher. Interesting article Sam. My last two employers didn’t offer a 401k, but I am really surprised to hear that nearly half of them DON’T. When I did have access to one, I always contributed enough for the match, but never any more. I always had a fairly low salary, and therefore wasn’t worried about minimizing my current taxes. I’ve also lived in Florida all my life. I saved and invested 25%-30% of my income every year…..including maxing out my Roth IRA, my taxable brokerage account, and rental property. I have always been interested in FI/Early retirement, and therefore didn’t want to wait until age 59.5 to access my money without penalty. Plus, I agree the government is wasting our money….which makes tax increases all the more likely (in my opinion). It really is one of those dilemmas if you’re looking for early retirement/FI whether to max out the 401(k). I’d look at the 401(k) for early retirees as an insurance policy along with Social Security.